Dauntless-Diabolical December: Community Painting Challenge | Azazel's Bitz Box. A trio of Astartes Dreadnoughts. To finish up the year, we’ve got something that rolls in the options from a few previous months. Much like Jewel of July, the idea is that December allows a wide range of models from centrepieces to low-level heroes. Krautscientist’s The Hound, Enkidu Lance, XII Legion 4th Assault Company. It’s for Heroes. Big or small. named or otherwise. A Lieutenant or a Medic or a Warlord Riding a Dragon. An Inquisitor’s aide or a Star Player or a Bounty Hunter. It’s for the more impressive scenery pieces. A desert oasis or a (ruined?) temple or a bunker complex or a single bunker or a skyscraper or a Ferratonic Incinerator or a Kwik-E-Mart. A forest worth of trees or a jungle worth of plants. It’s for Monsters. Ogres or Ogors. Dragons, Giants, decent-sized Daemons. Bronze Bulls and Dinosaurs and Great Wight Sharks and Goremaw and Cthulhu. It’s for Dieties and Demi-gods. Primarchs and Titans. Atlas and Aeres and Abaddon. Horus and Hercules. Venus and Vulkan. Saturn and Sanguinius. It’s for Mechs and the Mechanicum. 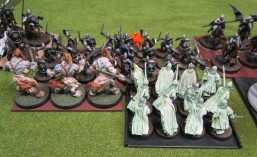 Steampunk walkers, Dreadnoughts, Imperial Knights, Warjacks, Tripods, Titans. It’s for Dioramas and Vignettes. Historical, Fantasy, Sci-Fi. It’s all good. Even better if they also feature something from the above! Sfjy’s Knight Castellan, in all its imposing glory. Pandoras Bitz Box’ “The Five Day Duel”. The Imperfect Modeller’s Duel between a Crusader Champion and a Red Dragon. 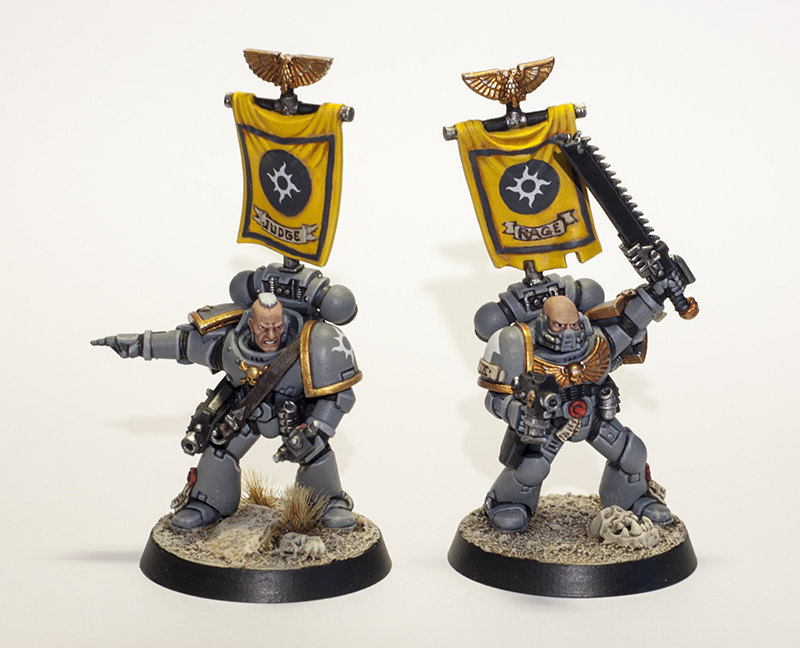 As always, the biggest distinction between this painting challenge and many others out there are that I only care about you completing these models. It’s not a “start-to-finish” challenge set during a single month, so regardless of whether you just missed out on finishing that diorama or tank this month, last month, or six months ago – or you’ve got stuff that you’ve been chipping away at for six months – or, indeed – if you’ve got models that have been shelved for months or even years, feel free to dig them out and join in. Similarly, if you want to go start-to-finish, then feel free to go right ahead. It’s about completing cool things. The challenge is designed to easily fit into your (and my) painting schedule and be flexible enough to encompass quite a lot, and hopefully just act as a bit of an impetus or inspiration to get this stuff completed and finish the year on a high note! This entry was posted in Monthly Painting Challenges and tagged Community Painting Challenge, Dauntless-Diabolical December '18. Bookmark the permalink. 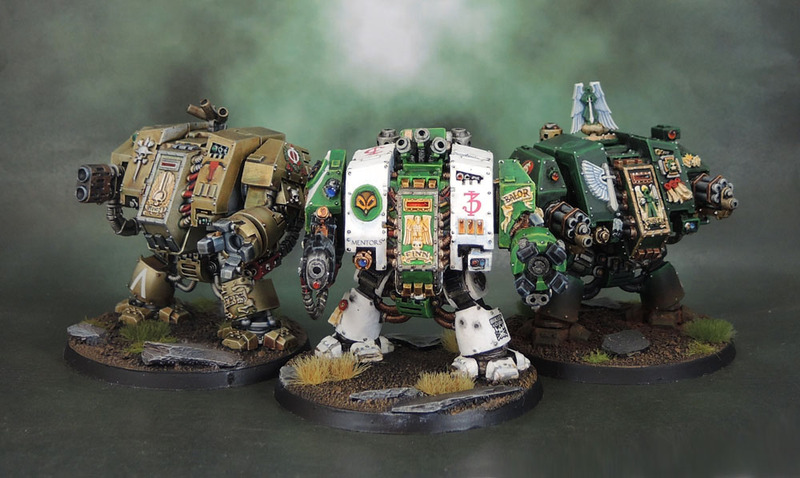 These Dreadnought look sweet! I don’t see much of your 40k stuff, they look really nice and I have a particular soft spot for the rediculously boxy Dreds. Very nice work. I’m currently working on my Ad Mexh Knight which I don’t know if I’ll complete in time… Really struggling with these large areas, they are so daunting! Really like the details on your walkers. Thanks mate. I still have not started on any of my Contemptors yet. Trying real hard to finish off things that I have started and just left. Yep, “neglected” before I start on much cool fun new stuff. Your big guy would fit into either November or December, so hopefully that is some help or comfort. Well in that case… best of luck! Ooh, cool one. Great way to finish out the year, too. I’ve mostly been working on Silver Tower and Rogue Trader stuff, so I might not have anything for November’s challenge, but there are definitely some things in my pile that will finish up nicely for this. Group pics added to the posts above. Right I’ll have a think and see what I can do. Got something in mind- its name will fit the diabolical bit…. Excellent. TIme to get that Demon/Diablo/Balrog/Balgorg/Bloodthirster model finally done! Not even close- it does have ‘hell’ in the name though. Sounds a good one… I have a nice Ghoul commanding Officer for my Witchlands campaign who would fit the bill and funnily enough I was thinking of getting him painted soon. Some Amazing work on show there. That would absolutely work. I look forward to seeing him in December! Hey, thanks IRO! I’ll send you an email shortly. December should be right up your alley, since you mostly do models that could easily be considered characters. I think it’ll be another Ork Boss. I suspect all my plans to get something done for November will come to nothing (unless the next week or so works out very differently to how it’s looking) but I’m sure I’ll be able to sort something out for December. I’ve got a few contenders in mind so I’ll see what I can do. Just knock out a bit more Necro-type terrain for November. That stuff all counts! Besides, you’ve already got a bunch of it done! True, I’d forgotten that stuff counted. Still want to get my murder cyborg done but if I work on him now it’s just going to distract me from the other things I should be working on, which is kind of against the spirit of the exercise! It’s pretty flexible, so hopefully you can find something that works for you! Absolutely! Sloped armour and absolutely no shot traps! None. No-sir-ee! Yeah, I figure it’s Christmas, so why limit it to only “centrepiece” models. Open it up just that bit more to any hero or character or vehicle as well and it lets a lot more people participate! Yay for December! I have a Star Player converted and just needs some touch-up painting. Ha, I say that now, and 3 weeks later I’ll still be working on him! Progress either way though. If I’m lucky I’ll get the 2nd Star done as well, but he’s only been primed so far. The Van Saar are still waiting for their buddies to show up, so they can play….so we’ll see! Yes! I am in, and it means that any of my tanks that wait for December have a place! Pingback: Technical Difficulties | Azazel's Bitz Box. Count me in please! I’ve painted a Dire Troll Mauler which fits the ‘monsters’ part quite nicely. Couldn’t make November so two for December! *Still no blog, but I’ve been planning on starting one as a New Year’s resolution. So maybe for the January challenge! Awesome stuff, mate – added in! Pingback: Rock It! – Just Needs Varnish! Not sure if it’s diabolical enough!